Ever feel like you’re on top of your finances during some months, and then barely making ends meet during others? This month you’re feeling great! You’ve paid all your bills, bought everything you need, and there’s still money left over in your bank account. Then the next month arrives, and with it comes your water bill for the past four months, your huge property tax bill, and two weddings you need gifts for. Suddenly you find yourself scrambling to pay for it all and still have money left for groceries. 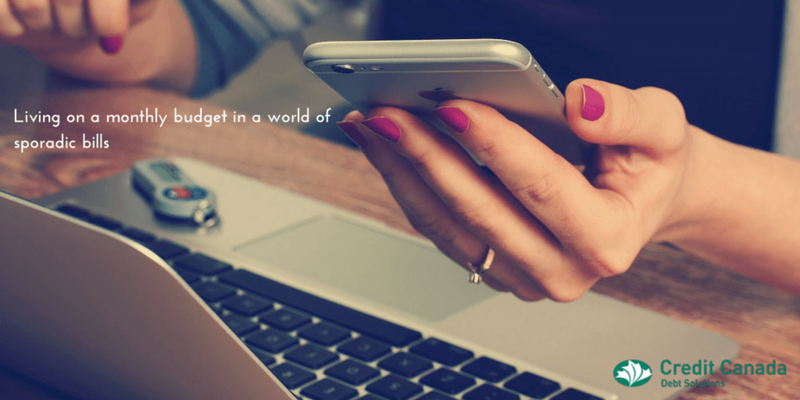 Creating a monthly budget is a wonderful thing. In fact I couldn’t live without one. Unfortunately it can be difficult to follow faithfully when so many of our expenses are variable, and to top it off, don’t occur monthly. After years of wondering what surprises my mailbox would hold for me each month, I decided enough is enough. Ignorance is not bliss. I don’t want to just make sure I’ve got enough funds to cover this month’s bills...but the month after, and the month after that as well.Many budgeting experts recommend that you set aside the allotted monthly amount for each of your irregular expenses and bills, so that when those bills come due, you’ve got the money ready for it. One method is to have labelled jars or envelopes for each of these expenses, and then once you get your pay cheque, pull out the correct monthly allotment for each expense and put it into the corresponding envelope or jar. This method is also great for controlling discretionary expenses such as entertainment and dining out. If you’re rolling your eyes right now thinking this does not work for you, you’re not alone! Sometimes it’s difficult to set aside money for next month’s bills because we end up needing the money for THIS month’s expenses. Sometimes we just don’t have time to sort out our money. So what else can we do to make our monthly budget more functional? Call your billers and see if there is an option to set-up monthly billing. More and more companies are now offering monthly instalment options as an alternative to one-time billing. Sign up for electronic billing. This way you will receive your bills as soon as they are sent to you rather than waiting for them to arrive by snail mail. This will at least give you a few days or even weeks of extra notice to pay your bills. When creating a budget draft a chart showing the 12 months of the year. For each month, fill in the bills that will be due that month and their approximate amounts due. You can get an idea of this information by looking at your previous year’s bills or banking statements. This could even include irregular expenses such as course fees, license renewals, summer programs for your kids and other expenses that don’t come monthly. Hang this chart somewhere and reference it at the beginning of each month or whenever you’re making financial decisions. Knowing that you’ve got three major bills due the next month may help motivate you to spend less or save more in the preceding months to save for those bills. Taking these steps may cost you a few minutes of your time, but having a budget that works is certainly is better than being left scrambling to pay your bills during heavier billing months.